It describes a “culture of complacency”, prone to “superficial and mechanistic” analysis, and traces a shocking break-down in the governance of the IMF, leaving it unclear who is ultimately in charge of this extremely powerful organisation. 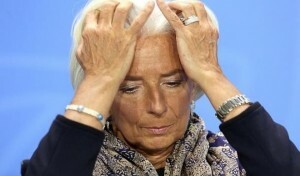 The report by the IMF’s Independent Evaluation Office (IEO) goes above the head of the managing director, Christine Lagarde. It answers solely to the board of executive directors, and those from Asia and Latin America are clearly incensed at the way EU insiders used the Fund to rescue their own rich currency union and banking system. 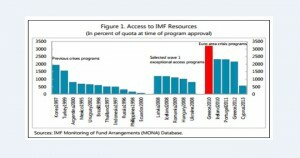 The three main bail-outs for Greece, Portugal, and Ireland were unprecedented in scale and character. The trio were each allowed to borrow over 2,000 percent of their allocated quota – more than three times the normal limit – and accounted for 80pc of all lending by the Fund between 2011 and 2014. “Before the launch of the euro, the IMF’s public statements tended to emphasize the advantages of the common currency, “ it said. Some staff members warned that the design of the euro was fundamentally flawed but they were overruled. This pro-EMU bias continued to corrupt their thinking for years. “The IMF remained upbeat about the soundness of the European banking system and the quality of banking supervision in euro area countries until after the start of the global financial crisis in mid-2007. This lapse was largely due to the IMF’s readiness to take the reassurances of national and euro area authorities at face value,” it said.